Cycling is a great way to find your freedom or to get the adrenalin rush from a longer ride or race; you are probably well used to inclement weather. If you’ve ridden in the cooler months or are planning to, then a good pair of cycling tights may be on your purchase to do list. When you ride to work you don’t want to be turning up to your destination with frostbite and solid kneecaps from the cold, and if you seriously ride and/or race then you will know the value and importance of keeping yourself warm and protected in the winter. For those not in the know; mention tights and the first thing that comes to mind are either Grandma’s tan specials or the slinky fishnet type that are best left for the night on the town. But in reality; of course; cycling tights are more like heavy duty leggings than tights per say, they are designed to be functional and practical not just for show. They are available in different lengths and are even offered as a bib type tight that is similar to the cycling shorts that are also on the market. Ultimately, they are an important piece of cycling gear if you want to keep warm on your rides either in the fall, winter or spring and this review of the best ten should give you a few pointers on what’s available on today’s market. 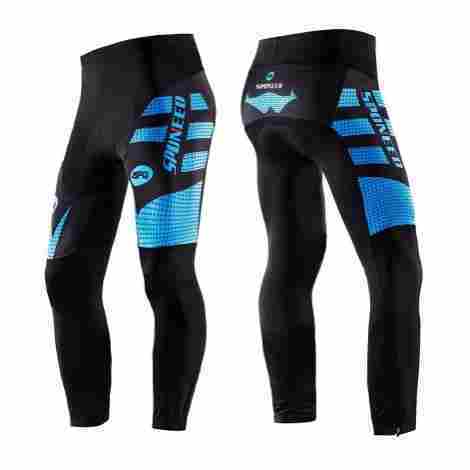 The basic considerations are to give you an idea of what to look for to make sure you get the best available pair of cycling tights that will best serve your own needs and requirements. These thermal tights are offered by Baleaf and are produced using ninety percent polyester and ten percent spandex for a stretchy comfortable wear that will serve well during the cooler and colder months. They benefit from being breathable and have the wicking qualities that will prolong dryness and warmth for longer periods. The versatile fit is suitable for a variety of activities to keep in welcome warmth and for added protection. The inside of these cycling tights is a soft fleece that not adds to overall comfort but maintains body heat for when the elements are biting. The reduction in moisture and sweat retention increase possible time outside in the winter. The Baleaf thermal cycling tights are fitted with handy leg zippers for maximum ease when putting on and removing, and the addition of simple but functional reflective elements mean an increased safety aspect for lower light conditions. The practicality, functionality, and versatility offered with these cycling tights give a great balance between both cost and value, combined with the fleece lining and wicking qualities – these are great overall value for money. These cycling tights are available in four striking color combinations; white/black, blue/black, lava/black and green/black. The stylish design offers a material base that is manufactured using eighty percent polyester and twenty percent spandex for a comfortable fit that boasts keeping in warmth without the use of a fleece liner. They are suitable for wearing in temperatures between forty-five to sixty degrees Fahrenheit which makes them practical for a variety of outdoor pursuits. 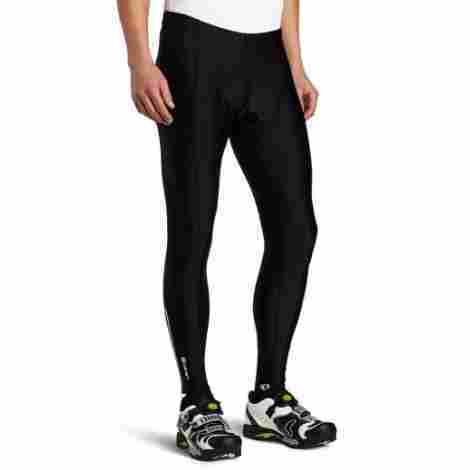 Sponeed offers these compression tights which have the benefit of a four-way performance stretch that will keep wind chill to a minimum and enable a prolonged ride in the cooler months. The design boasts not sticking to the skin even when sweat builds. The tights have a silicone ankle grip strip that keeps them in place when on the move, and the handy zippers make dressing and removing a breeze. The 3D padding is placed to reduce chaffing and stress on impact points on the bottom to give a more comfortable ride. These Sponeed 3D cycling tights are produced for performance and combine features that increase comfort for the all-weather cyclist. The relative equality between both the value and cost is well represented in these tights and they are a great buy. These Przewalski cycling tights boast being suitable for hot and cold days; and offer a durable blend of seventy-one percent polyamide and twenty-nine percent elastane for a superior and comfortable fit. They benefit from breathability, high-level moisture wicking and as an added bonus – are quick drying as well. The fabric is four-way stretchy and provides a lightweight and durable wear for prolonged comfort in use. The fit is designed in an anatomical fashion that actively supports muscles during exertive cycling and also offers sixteen panels that boast being crease resistant which reduces the risks of bunching and scrunching causing chaffing and sores. The cycling shorts have an ergonomic 3D pad that is one point five-centimeter thick high-density sponge, that makes a longer ride more sustainable with the increased comfort levels it offers. It benefits added wicking and breathability for a ventilated, dryer ride. The quality four-way stretch fabric these Przewalski cycling tights are manufactured in, combined with the comfortable 3D padding, ensure that these are great value for money – with features that enable tougher and longer rides. These pro gel cycling tights are produced using eighty-two percent polyester and eighteen percent spandex for a comfortable, unrestricted use during riding. 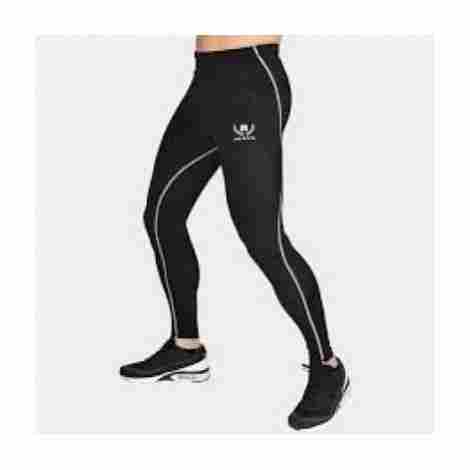 They boast being lightweight and professional in design and fit and offer compression to improve circulation during exercise. They are sleek and reduce wind chill and moisture build-up for extra comfort, they are available in a good range of sizes suitable for everybody who wants a professional edge on their cycling. The cycling tights have a six-panel gel pad that gives ultimate comfort where it’s needed most, reducing stress on pressure points and preventing painful chaffing and sores from prolonged periods on the saddle. These tights have ankle zippers for ease putting on and removing; that have reflective elements for improved safety in changing light conditions and have a soft silicone grip around the ankle to prevent uncomfortable riding and twisting. When considering the professional features and lightweight design of these cycling tights; and adding the functional ankle zippers and reflectors too – both the balance of cost and value is reflected well in the quality and the price. These comfortable and stylish cycling shorts are offered with two colors of contrasting piping – pink and blue. They are manufactured using eighty-two percent nylon and eighteen percent spandex that improves fit, elasticity and breathability. The design is comfort fitting and doesn’t restrict active movement with bunching or gathering, this reduces the chances of friction chaffing and sores with prolonged use. The cycling tights are fitted with a comfortable 3D pad that boasts using foam instead of gel for a superior level of cushioning where it is needed the most and where the most benefit can be obtained with its placement. Reflective strips are added to these tights for improved safety when light conditions alter, and the compression they offer a longer use without discomfort for the active rider. And for added confidence, there is a full one-hundred percent money back satisfaction guarantee. When considering the full balance of cost and value; and taking into account the comfortable fit these tights offer with the practical and functional features, it is justified to say that these cycling tights are good value for money. These stylish, gel padded cycling tights are offered with benefitting sunscreen and quick drying properties that will provide prolonged comfort over time. They utilize a mesh panel for increased breathability and added protection against wind-chill in the colder months. They boast being high in elasticity that improves comfort and reduces possible chances of chaffing and sores from bunching and twisting. The cycling tights have three layers of composite fabric in the front panel for increased comfort and breathability and includes a TPU inner. The silicone gel padding is placed to provide more than adequate protection from saddle sores and pressures. The zippers are strong and handily placed with emphasis on offering ease of use with maximum support, and the tights are fleece lined for added protection against the winter cold; when the lighting is changeable – they have a vital reflective logo for better visibility. For a reflective consideration between both the value and the cost, the functional features that include the front panel components and the silicone gel padding; ensure that money spent on these tights is money well spent. These cycling tights are offered as a support for muscles during riding and are versatile enough to be used in a variety of sporting activities when muscle protection and support is beneficial. The compression cycling tights are boosted with an all year round and all-weather application, they boast being able to keep in the warmth in the cooler/colder months and to help maintain cooler wear in the warmer/hotter months. The Mava sports compression cycling tights have the added protection that includes UVA and UVB cover as well as antibacterial protection for reducing the build-up of odors and bacteria giving a more functional garment for extreme sportswear. The fabric used to manufacture these tights benefits from offering both breathability and superior moisture wicking for an overall improved comfort fit, they are lightweight and quick drying and have the added functionality of being suitable as a base layer or on their own. The overall balance between cost and value is reflected well; with the fast drying and elastic flexibility they offer combined with the muscle support – ensures that these cycling tights are excellent value for the price. The Yogipace thermal tights are conveniently available in a variety of leg lengths; twenty-five inches, twenty-eight inches and thirty-one inches to ensure a better and more comfortable fit. They are fully fleece lined to offer a warmer ride and boast being versatile enough to be worn as a base layer in colder temperatures. These tights are figure hugging and are made with enough flexibility to reduce uncomfortable twisting and chaffing. The tights have a unique elastic draw-string waist so can be adjusted to fit for maximum comfort; they also benefit from a hidden pocket on the waistband for safe storage of valuable small personal items during exercise; plus; an additional back pocket that is securely closed with a zipper. The tights offer a level of low-grade water-resistance for deflecting sprayed surface water and lighter rain. They are produced using a lightweight and practical mix of polyester and spandex for a more comfortable fit with improved flexibility. Considering the versatility offered with these Yogipace thermal tights; and combine that with the water-resistance they provide and the handy, practical pockets and adjustable draw-string waist; it is clear that these functional tights are good value for money. 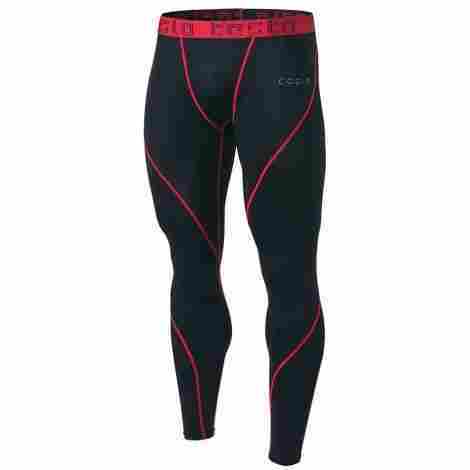 These compression tights are available in a huge variety of striking contrasting colors, they are produced using eighty-seven percent polyester and thirteen percent spandex for ultimate comfort during a variety of sporting activities as well as cycling. 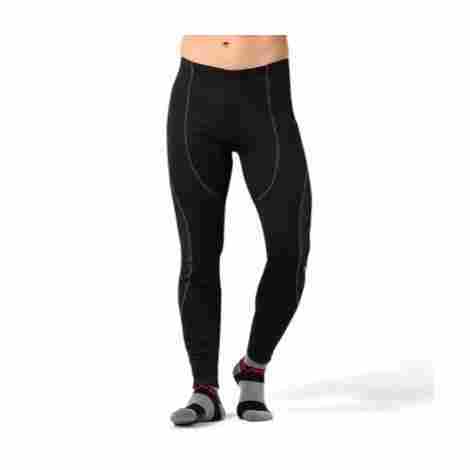 They are practical enough to be worn as a protective base layer and according to the size ordered; boast being either a regular fit when going one size up, or an extreme compression fit with the purchase of the usual personal size. The Tesla compression tights benefit from being functional for all weathers and most temperatures; offering cooling moisture wicking and quick drying fabric that will reduce excessive moisture build-up and possible chaffing and sores from damp material next to the skin. The tights boast optimum flexibility and elasticity that won’t restrict movement, bunch or twist. They also have moisture sensing and two-way circulation to further improve the comfort levels felt during any sporting activity. 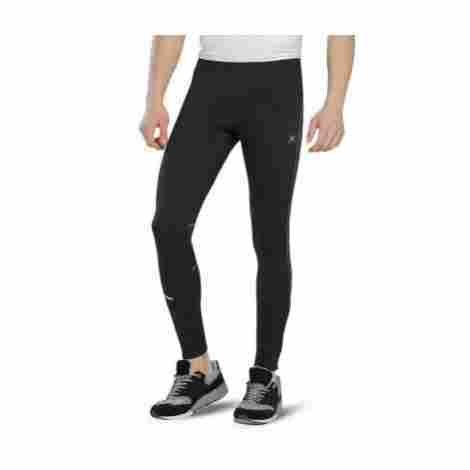 These compression tights are practical and functional for a range of uses, and the full spectrum of available colors combined with the all-weather fabric, and the moisture wicking and quick drying aspects, add up to ensure these are great value for money. 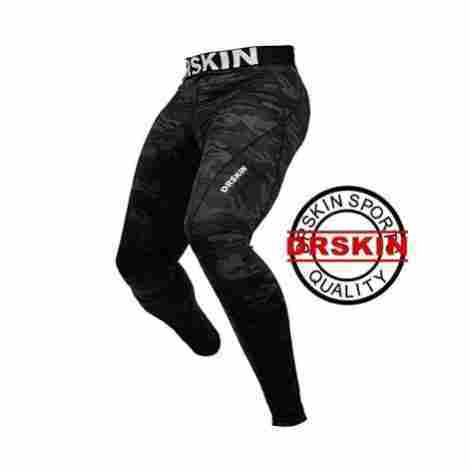 These DRSKIN tights are produced using ninety-two percent polyester and eight percent spandex for a more flexible and comfortable fit. The fabric boasts being both lightweight and feeling soft for optimum functionality. They are offered as being practical for any weather and most temperatures; as well as being versatile enough to use on a wide range of different applications and sporting activities. The improved flexibility and elasticity proffers no restrictions on movement and improves durability. The fabric used to manufacture these tights boasts being moisture sensing, quick drying and offers two-way air circulation which improves their use even in warmer or hotter climates. The moisture wicking and dry transport is another added bonus with these tights. These tights are sewn using a unique sewing system that avoids overlapping fabric edges and therefore is more comfortable next to the skin; they offer reduced resistance against movement a proportionate drop in chaffing and sores. The DRSKIN tights are offered with practical features and a useful, functional blend of fabrics to provide the best comfort and moisture wicking, whilst remaining comfortable for lengthy use and remain durable for a variety of activities. Overall a great purchase for the price. So; if you want to continue your cycling through the cooler months, a pair of cycling tights will be the answer for you. Essentially; they are smart trousers with a bit extra on the side; they can protect you from the cold, the wind and the rain so your enjoyment won’t be stifled by the uncomfortable results of bad weather. A basic reason for purchasing a good pair of cycling tights is your overall performance in the cold, it is a common fact that our human muscles just don’t work as well when they are cold. Even if you are just commuting to work on your bike for a few kilometers a day, the consequences of not being properly prepared can not only be painful but also debilitating. For the more experienced or professional riding; the result of not wearing appropriate gear can be worse still and can even put a grinding halt on your ambitions. The true value of getting the purchase right and buying a pair of cycling tights for the conditions you expect to be in – can be felt with your comfort levels on every winter ride. Some factors may not seem relevant to you, but if you want to get the best out of riding in all temperatures and all seasons there are a few variables that can affect your passion. You may want to consider if you may benefit from compression tights; these are specifically designed to reduce muscle fatigue and damage in specific areas, and if you’re familiar with aches and pains on your longer rides then you will appreciate the full value of these tights. Aside from the fit, you may also prefer three-quarter length tights, these can be more practical in warmer weather and are easier to get on and remove than full leg length tights. Zippers around the ankle are another factor you may want to think about; cycling tights are meant to be ‘tight’, but too tight without a zipper on the ankle can be very uncomfortable to use. Of course, you know your own requirements and your own limits; but as long as you buy carefully with these considerations in mind – you should be well on your way too many hours of adrenalin-fuelled rides in any season and any weather. There are a good variety of cycling tights in the following review, and there are types to suit all levels of cyclist from leisure to commuting to riding professionally or even racing. To build on the basics for your search for the best cycling tights; you may want to peruse through these few features that can play an important part in getting it right. For starters, you should think about what conditions you will be riding in, and the specific purpose of your ride. This may sound too simplistic but in reality; it can really make a difference. For commuting, for instance, you may need to consider the water-proofing the tights can offer to make sure you don’t get a soaking on the way to work. Wind-proofing should also be a factor for you to think about; wind chill can seriously make the temperature plummet – especially when you are riding. Thermal properties should also be considered as we have noted, our muscles do not work as well as we would like them to when they get cold. If you are a long-distance rider or take part in regular runs or indeed for the racers out there; the variety of cycling tights is quite varied; and you need to make sure the ones you have your eye on, won’t affect your performance or over-all comfort. It can literally make the difference between an unsuccessful or successful ride. The fit of your cycling legwear will vary as will your requirements, if you are looking for a quick fix on a short ride or commute, you can readily find simple water-proof and wind-proof trousers that pull up over your everyday wear. These are very practical if you are on your way to work or an engagement and will enable a quick removal when you arrive. For legwear that enhances your comfort during long runs or races a performance led pair of cycling tights are the best way to start. These are close fitting and have the advantage of allowing your free movement without restricting you. 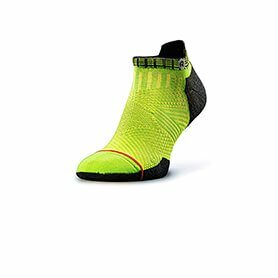 They are offered in different lengths but for maximum protection; they go all the way to the ankle and provide full coverage in cooler conditions. Fundamentally there are two generally available styles of cycling tights that can serve different preferences and requirements. The first is a simple tight design that fits from the waist to the ankle giving you superior coverage and allowing you free movement when you are cycling in the colder months or in the wind and rain. An alternative available is a bibbed cycling tight set that offers an all in one style fitting that can be more comfortable due to the loss of the waistband, they are also efficient at keeping out unwelcome drafts that can instantly lower your core temperature. These bibbed cycling tights are practical and functional, but one significant negative feature of this style is the mild inconvenience you may encounter when nature calls and you need a bathroom break. Weather specific types for different seasons may sound slightly extreme but you are better to take a little extra time planning if you want ultimate comfort. Warmer weather tights are produced using thinner materials such as simple Lycra and can even offer some UV protection, but you would be best advised to check the ratings on the product and use sun lotion as required. Also available are water-proof cycling tights that will help you to retain body heat that can be lost in wet conditions through wind-chill. For an improved cooling feature; there are also tights that are three-quarters in length. These are between shorts length and full leg length and provide allowance for air to flow nest to the skin for a better cooling effect. Next; with the progression of the cooler seasons and winter, there are thicker fleece lined cycling tights that offer better protection against the cold and wind-chill factor that can slow you down and make your ride uncomfortable. The basic material is thicker than warmer weather tights and often include the use of technological advantages such as wind-stopper and air-block fabrics. Another consideration for you to peruse is the question of padded cycling tights. The level of your riding and how long you intend to ride for may have a bearing on your decision on what type to buy. Padding comes in a variety of thicknesses and offer different levels of comfort and help you to avoid painful chaffing and soreness. It may be worth remembering that your bottom is the biggest point of contact when you are riding so you are well advised to look after it. You can buy cycling tights pad free but if you are buying some with it included a few basic pointers will put you on the right track. Density is a bigger factor than how squishy the padding is, the squishier and softer the chamois – the faster the thickness will deteriorate and a quicker way to a very uncomfortable ride. And another thing to consider is getting a pad that is breathable and anti-microbial; this will reduce moisture build-up and create less friction when you are eating miles. Contouring of the pad is also relevant because different gender-specific chamois will have different areas of contouring and padding thickness. The position you ride in as well should be taken into account; for example if you are a hardy racer and assume an aerodynamic stance, or if you are leisurely sit up and ride type – each position can make a difference how your padding works and if you consider these few basics before you buy; you should be well on the way to a comfortable ride. Q: Do I wear cycling tights under or over my shorts? A: It is recognized that they are better worn over your shorts, which will probably have their own padding inside so are designed to be next to the skin. If you wear padded cycling tights, it may be advisable to wear un-padded cycling shorts underneath because if both items of clothing are padded – you may find yourself walking strangely. Q: Are cycling tights uncomfortable around the waist? A: They shouldn’t be uncomfortable as long as you have purchased the right size and fit, they are usually held up with a broad elastic waistband, that if worn correctly shouldn’t cause discomfort. For the bibbed cycling tights of course, the requirement for a waistband is removed and thus these are more comfortable if a little cumbersome to remove for rest breaks. Q: Can I wear a normal pair of leggings instead of proper cycling tights? A: Of course, nobody can tell you what to wear when you’re cycling, but you may want to consider the benefits of wearing the right gear especially if you are a hard or experienced rider. For shorter less challenging rides there is no reason why you shouldn’t wear leggings, but for the long rides or commutes, the design and fabric used to make cycling tights will keep you more comfortable. And if you are riding in inclement weather; you can get different thicknesses of wind-proofing, water-proofing and cold protection to keep your legs warm and not in direct contact with the outside elements. Q: I’m riding in the middle of a really cold winter, do I need two pairs of regular cycling tights? A: This would create too much bulk for you just where you don’t need it and could increase moisture and bacteria build up as well as being restrictive and uncomfortable. Your best bet is to look for a decent pair of winter tights that are designed for colder, more challenging temperatures. These are often made with a thicker material and may have a fleece lining to offer you much-needed protection from the elements. Q: Are cycling tights water-proof? A: Not all cycling tights are water-proof, for the best advice it is recommended that you check each product’s individual specification to see what level of water-proofing or even water-resistance they have. If you are just after a quick fix for your commute; then a basic pair of water-proof trousers may be more practical. Q: Do my cycling tights need to be really tight? A: As long as you buy the correct size for yourself the cycling tights shouldn’t be so tight that they are uncomfortable and restricting if they are too tight it can cause uncomfortable cutting and may even cause skin abrasion with rubbing. Conversely; your cycling tights shouldn’t be too baggy or loose otherwise the benefits will not be fully realized, they won’t keep you protected and may even slow you down or get caught in your wheels.